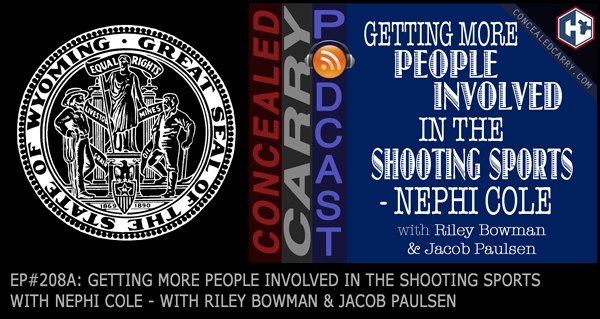 In this special bonus episode, we play back the interview Riley and Jacob was able to do with Nephi Cole, Policy Advisor to Governor Matthew H. Mead of the State of Wyoming. They have been doing some amazing things to attract firearms business to their state and grow their economy. One initiative that is having a great impact on the growth of and perception of the Second Amendment in their state is by working to get more people–adults and children alike–involved in the firearms community. They have established a simple, although not easy, shooting competition called the Wyoming Top 100. And last year was the inaugural Wyoming Governor's Match, a 2-gun match that brought in shooters from across the country. PLAY above to listen to this highly inspirational interview! Aftershock of the Gun Control, School Walkout.